REYNA GRANDE went to the US at age nine to join her parents, who had left her behind in Mexico for several years. She went on to become the first person in her family to obtain a higher education. She attended Pasadena City College for two years before transferring to the University of California, Santa Cruz, where she received her BA in Creative Writing and Film & Video in 1999. She also holds an MFA in Creative Writing from Antioch University. 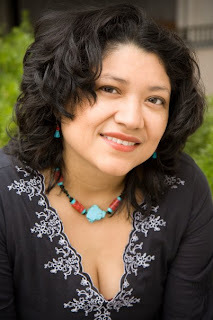 Her first novel, Across a Hundred Mountains (published by Atria/Simon & Schuster in 2006), received the El Premio Aztlan Literary Award in 2006 and an American Book Award in 2007. Across a Hundred Mountains has been made required reading at various high schools and colleges across the US. Her new novel, Dancing with Butterflies, will be published by Washington Square Books/Simon & Schuster on October 6, 2009. Grande, who lives in Los Angeles, California, is currently working on a memoir. I’m left-handed and damn proud of it. Terrible. My siblings and I were always hungry, running around barefoot, dressed in rags, our hair home to lice and our stomach home to tapeworm. Both our parents were in the US and we had no idea if they would ever come back. Where do you live now and what is it like? I live in Los Angeles, California. Not enough trees, way too many cars. Now that you live in the US, what do you miss most about Mexico? I miss the simplicity of life in Mexico. People there know how NOT to waste (food, money, clothes, water, etc.). They recycle, re-use, and everything else because they can’t afford not to. Here in the US, people spend beyond their means. We don’t know how to live more in tune with the environment and protect it. In your opinion, what’s the American Dream? For immigrants, it’s having what you couldn’t have in your own country. When I read Sandra Cisneros’s The House on Mango Street. No, I didn’t really think of being a writer. I wanted to be a painter, but then I met a teacher at my city college who convinced me I had more talent as a writer. I had no idea what I was getting myself into. I thought being a writer was that—writing. But it is being your own secretary, your own distributor, your own publicist, everything. Writing a book is only the beginning of a long journey. What do you enjoy most about your life as a writer now? I love being part of something great—Chicano/Latino literature. I love my relationships with other Latina authors and being one of them. I love the fact that if I were to die today, my children would always have a way to reach me—via my novels. I love putting my imagination to use. I love the act of creation. I write when I’m inspired. When I’m inspired I can write day and night. What part of the process do you enjoy most as a writer? I love the act of writing. To see a character emerge. To weave beautiful words together. Was it difficult getting your first work, Across a Hundred Mountains, published? Yes and no. Some writers can spend years trying. It took me about four months. But during the process I had several rejections because publishers were looking for the next hottest Chica Lit novel. I don’t write chick-lit and they wanted me to change my novel so that it fit that genre. Did you experience much difficulty in finding an agent or a publisher? I found my agent very quickly. I was lucky. Could you tell me a bit about Dancing with Butterflies? What was the seed of the novel? The seed of the novel was the semester I spent dancing for Grupo Folklorico Los Mejicas at University of California, Santa Cruz. I absolutely loved Folklorico. Due to the lack of time I wasn’t able to devote myself to becoming a good dancer, but I always wished I was in a group. So I decided to write about a Folklorico group and its members. How did you go about researching Dancing with Butterflies? I interviewed Jose Vences, artistic director of Grandeza Mexicana Folk Ballet Company. I also read two self-published books about the history of Folklorico. There was nothing at the public library about this subject, so it wasn’t easy to research, but I managed. Do you know where you are going with a novel as you write or does it evolve on its own volition? My novels emerge one scene at a time. I never know where it is going. I just follow my instincts and somehow I end up where I’m supposed to! How do you know when your manuscript is completed? I never feel my manuscript is completed. My editor has to yank it out of my hands. There is always another scene that can be worked on, another character that needs more development, etc. With Dancing with Butterflies I started getting carpal tunnel and that made me give up the novel to my editor, otherwise I would have asked for an extension! What did you learn about yourself in the process of writing both your novels? I learned that I am now officially a real writer. The first book could have just been a fluke. But now I have proven that I can indeed write another book that is just as good as (or better than) the first one. In middle school I read a lot of fairy tales because they were easy to read (I was learning English at the time). Then I read Sweet Valley High, and thrillers written by Christopher Pike. Then I fell in love with V.C. Andrews and Stephen King. In high school I read a lot of romance novels. But it wasn’t until college that I was exposed to Latino literature. Who are some of your literary heroes, so to speak? Have they in any way contributed to the making of who you are as a writer today? My heroes are Latina writers such as Sandra Cisneros and Helena Maria Viramontes. They have worked hard to be where they are now. In some ways they made it easier for me to get published. So I feel I have to live up to the expectations they have set with the quality of their work. Who are some of your favourite contemporary novelists? What are some of your favourite contemporary novels? Do you have an all-time favourite novel? Here are some of my favourite books: Sandra Cisneros’s The House on Mango Street, Marion Zimmer Bradley’s The Mists of Avalon, Ayn Rand’s The Fountainhead, Kahlil Gibran’s The Prophet, Margaret Atwood’s The Handmaid’s Tale, Kim Barnes’s A Country Called Home and Laura Esquivel’s Like Water for Chocolate. Could you suggest a couple of novels that you think haven’t got as much attention as they should? Yes, 99 per cent of Latino novels. What kinds of books do you read nowadays? Any particular genre? What are you reading at the moment? I’m reading different stuff. I am a judge for a literary award so I got a box of 96 books to read. I like some, some I don’t. I’m just trying to get through the box at the moment, but I enjoy reading so that’s what counts. Who are some of your favourite Mexican authors? I really don’t like saying I have favourite authors because sometimes I might just like one book they’ve written but not all of them. I think writing classes are useful, but sometimes when you are non-white or writing something not “mainstream” it is hard to get a lot of support in classes. For example, most of the time I was the only Latina in my writing classes at the University of California, Santa Cruz, and my teachers and the students didn’t “get” what I was writing about. So that could be hard to deal with. Another thing that would help is editors having higher expectations of their authors, and authors having higher expectations of their own work. I’ve been asked to blurb (endorse) books that aren’t ready to be published and I don’t know why editors didn’t ask their authors to keep working on them until they were ready. Art shouldn’t be rushed. In your opinion, what are the essentials of good fiction? What distinguishes the great novel from the merely good? This is a hard question. I’m not the fiction police! I think it is just a matter of making everything work the way it should work. Tell me about your efforts at bringing literature to and promoting reading in US schools. I have travelled up and down the country to talk to students about the importance of reading and pursuing a higher education. Maybe if the money ever starts coming in, I could set up scholarships and such—I would love that! For now, I am limited to just being a cheerleader for literature.